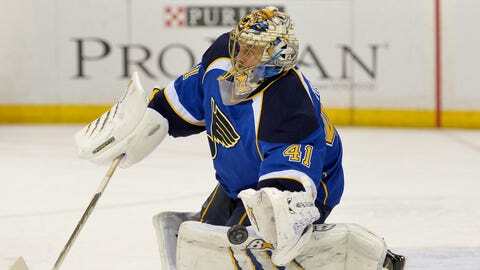 Jaroslav Halak stopped 25 of 26 shots against his former team to earn his 76th win with the Blues. ST. LOUIS — Jaroslav Halak was ready on Thursday night. When Montreal’s Michael Bournival burst free on a breakaway less than 2 minutes into the first period, the Canadiens were in prime position to claim the game’s first tally. Halak was ready and turned away the shot. It’s a moment that may get lost in the highlights of the St. Louis Blues’ impressive 5-1 victory — also known as the Alexander Steen show — against the visiting Canadiens on Thursday in front of 17,189 fans at Scottrade Center. "I think it also helps our guys, they see that there’s a goalie that makes a save and I think maybe they kind of relax a little and start playing the game," Halak said of the save on Bournival. "It was huge for me and for our guys. The first period was really impressive for us and it was great to see guys step up." It was also a strong opening act as part of a big night for Halak, who stopped 25 of 26 shots against his former team to earn his 76th win with the Blues — tying Brent Johnson for the fifth-most in team history. Halak, who improved to 17-6-2 on the season, had allowed 10 goals on 68 shots in his last three games, a save percentage of .853, and was having a rough start to the month of December. He had allowed at least three goals in four of his first five starts in December. After recording a .917 save percentage in October and a .914 save percentage in November, Halak went into his start Thursday night with an .877 save percentage in five December games. The Blues had lost three of those five contests. "I think the last couple of games it’s been weird bounces were going in and it’s tough to win games like that," Halak said. "I was happy tonight that the bounces were on our side and that usually those goals that we gave up lately, they didn’t go in tonight. It was a big first period and a big win for us." It was the kind of win the Blues (23-7-4) — still short-handed without captain David Backes and top six forward Vladimir Sobotka — needed following back-to-back losses to the Sharks and Senators and before heading back on the road to Edmonton and Calgary. "If you look at our first periods lately, they have been not the best," Halak said. "We’ve been giving them goals. But tonight was the opposite, going into the second with a lead. I think guys did a great job putting an emphasis on the start of the game and the first period. I think it worked out tonight. We just need to play the same hockey and play for 60 minutes the next game." The Blues are now 20-1-2 when they score first this season, compared to 3-6-2 when their opponent scores first. Halak’s save on Bournival’s early chance helped set the tone for the night. The goalie saved all eight shots he faced in the first period, stopped five of six in the second and then thwarted all 12 shots the Canadiens peppered him with in the third period. "He’s been good," Blues defensemen Jay Bouwmeester said. "I don’t think he’s the reason we’ve been losing or anything like that. We’ve been giving up too many opportunities. He played good tonight. I know you always kind of want to beat your old team, and I’m sure he was fired up for that and did a good job." Montreal selected Halak in the ninth round of the 2003 NHL Draft and the goalie played four seasons for the Canadiens before the Blues traded young forwards Lars Eller and Ian Schultz for him following the 2009-2010 season. Halak is now 4-0 in four career starts against Montreal, allowing just four goals on 100 shots, a save percentage of .960. "Yeah, on the road we’re going to play the Montreal Oilers and the Montreal Flames and see how we do."